History on Champlain shows that Missisquoi Bay is a factor no matter the time of year, so I began my search here. After launching from West Swanton Ramp, I began on Donaldson Point on the Western side of the bay. Here I found good weeds reaching from the shoreline to 8 feet of water. Pitching jigs into them failed to produce, so I began slinging topwater and had a handful of blow ups, but never hooked up except for a single pike. Clearly, they were territorial bites from the fish and not eating. After going around the point I hooked my first bass of the trip - a 13” largemouth on a wacky rigged Lochness Lures Leviathan. Weather was the story of this day. A stiff north wind and waves greeted me the moment I launched from Point Au Roche Boat Ramp. Heavy rain was also in the forecast. Still it was a goal to cover several spots, but the waves made it difficult. After an excessively “bumpy” ride to La Motte Passage, I worked the east side without any success. Smallmouth bass were supposed to be spawning, and I observed many beds, but all were empty. I kept my eyes wide open, and simultaneously fan casted with the tube, jerkbait, chatterbug, and Leviathan. But I never caught a fish. If Day 2 had a bunch of running around, then Day 3 is a bit on the ridiculous side. The pressure to find more and better fish was beginning to mount. 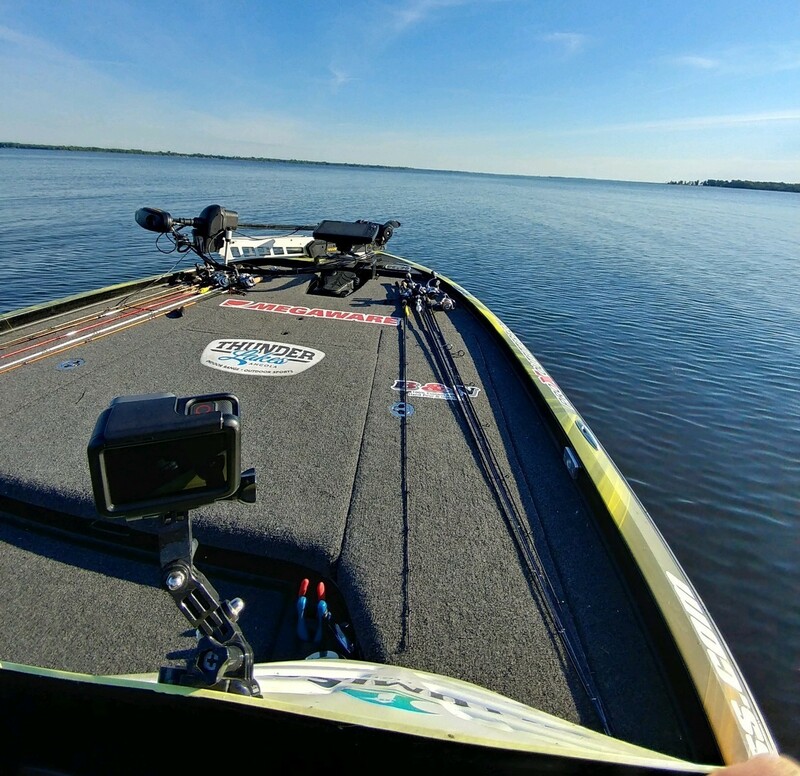 Since my best areas would take me through the Alburgh Passage, I wanted to explore the passage thoroughly, and took off from the ramp that would be used for the tournament, the Plattsburgh City Ramp. After another rough ride, Macomb Bay was my first stop, and it stunk. The wind was blowing in from the north, which looked like an ideal place to get some active fish, but except for a few perch, nothing bit my lures. Without a flogger to assist me, the only chance I had at finding bedding smallmouth was a calm lake. This was going to be the calmest day of my practice. I took off from Chazy Landing while the light was still low and probed the Point au Fer Reef. After 30 minutes I caught a 3.5 pound largemouth with a Monkey Punch. The last fish I expected to catch from these rocks was a largemouth, so I chalked it up as a fluke - unreliable. The Monkey Punch tricked a pair of little smallmouth as well. Lake Champlain, I’m convinced, is never calm. Despite little to no wind forecast, there was still plenty. Defiantly, I went to Sandy Point along Isle La Motte and worked north in shallow water looking for bedding fish while fancasting the Leviathan. I caught several small fish fancasting, and found 2 fish bedding. One was just 2 pounds, but the other was 3.5 pounds. It was easy to see and extremely aggressive. There was no need to rush to the ramp on this day. Co-angler and I were boat #198. Eventually, we took off at 6:25, but were not due back until 4:40 - 10 hours of fishing! Plus, the lake was uncharacteristically calm. My second cast at the City Ledge gave up a solid keeper on the tube. 15 minutes later I set the hook on the biggest bass I had hooked all week, but during the battle it broke my line. I. Was. Not. Happy. The mission was simple: make the Top 10 cut. But I didn’t come close. 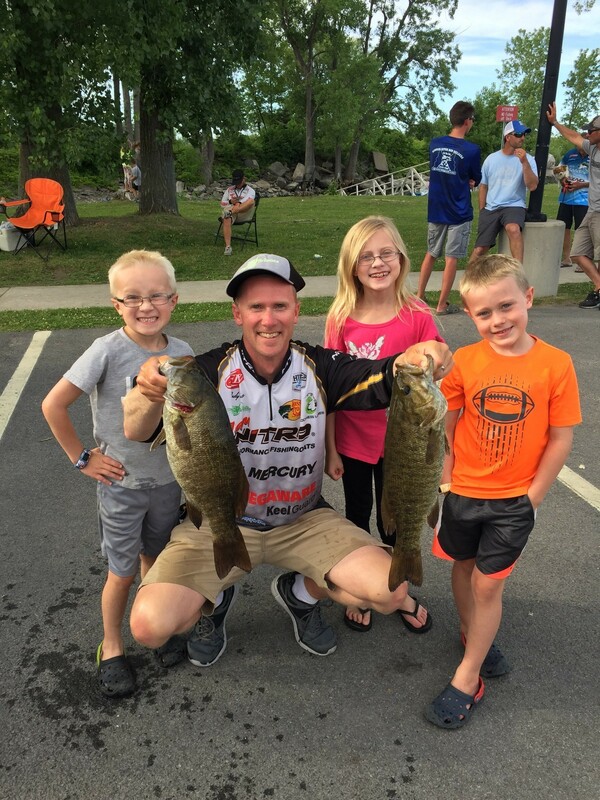 Normally, I go into the Open Tournaments with the goal of getting paid, which is historically 15 pounds a day on Lake Champlain, but I wasn’t fishing for points this year. It was not from a lack of effort, as I spent 12-13 hours on the water for 4 consecutive days. It was also not from a lack of finding fish - I caught both quality largemouth and smallmouth in practice. It came down to a lack of execution and poor decision making. 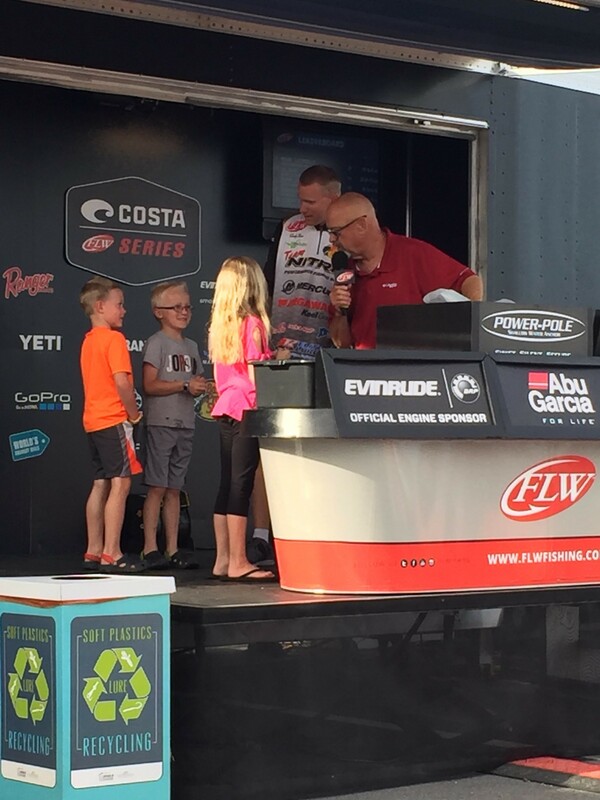 This is my story from the 2018 FLW Costa tournament on Lake Champlain June 21-23. Before wrapping up the day, I wanted to try the City Ledge, which is south of Missisquoi. It was a great decision. There were a few other boats already there so I nudged myself in. It was clear to see why they were there. In 30 minutes I boated 3 on the tube, including 2 over 3 pounds, and saw another half dozen caught by the other anglers. I had 3 waypoints, and after a full day felt I had 2 spots holding above average fish. This ended up being a record setting attendance for the Costa Series - 204 boats! They would pay back the top 53 anglers. Incredibly, I was boat #8 for take off. Normally, a low boat draw is a good thing, but I was actually hoping for a higher number. With the way my week went, I felt a higher number, which would result in longer fishing time, would help me out more. As it was, I would take off at 6:00 and was due back at 2:00. My co-angler was from Michigan and an experienced angler. It was not an easy ride to Pelots Bay where I began. Strong North winds were, again, prevalent. In calm conditions, it takes 17 minutes to get there, but took 35 today. There was no doubt in my mind that Pelots Bay would produce like it did on my second day of practice, but I was wrong. We covered every inch I wanted, but after 90 minutes neither of us had caught a single fish. This was poor decision #1 - I should have begun on the smallmouth because they were greater in number, but I had begun on largemouth hoping for a larger fish. It was a gamble that failed. Shortly after, I ran to The High Rocks (left) on the eastern side of the bay. Traversing along the point while staying in US waters was tricky. I fretted submerged stumps and logs and the water was skinny. Upon arrival, I began twitching a perch colored balsa jerkbait given to me by Greg Rekeweg at Thunder Lakes Indoor Range and Outdoor Sports. 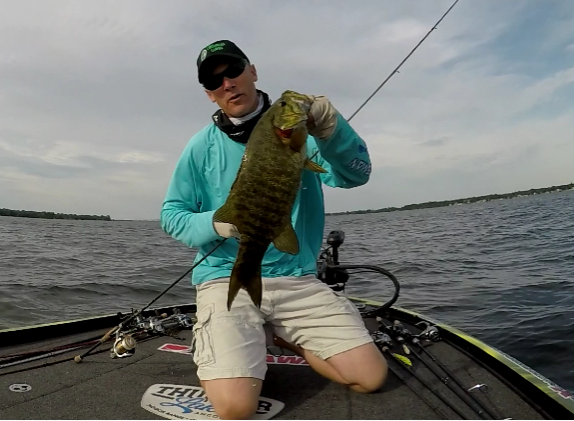 The action was great and a 2.5 pound smallmouth bass followed it back to the boat on my first cast. My second cast hooked a 30 inch pike, and 5 minutes later a 5 inch smallmouth bit. Unfortunately, those were the only bites it produced all week. This was perplexing, because Champlain is known for its jerkbait fishing. But no matter which model or where, I never got another bite. I worked south down the entire bank to Rock River Bay. There I landed a small largemouth off a 9k Elite Lures ½ ounce green pumpkin jig with a matching B & N Custom Baits trailer on a laydown. I went under the bridge into Rock River and had a good fish blow up on a frog, but did not connect. A little bit later I landed a big bowfin on the same jig. After coming out of the river, I ran down to Phelps Bay and caught a handful of fish with a ½ ounce, white 9k Elite Lures Chatterbug matched up with a Gary Yamamoto Zako. None were were worth bragging about. The average size was 2 pounds, but none bigger than 2.5 pounds. Again, the focus was a Top 10 finish, and I figured 18 pounds per day would be required to accomplish that. Eventually, I got to Martindale Point and worked the outside weed edge. Working north along the break, I caught some small bass and pike on an Xtreme Bass Tackle tube in the Formula G3 color scheme with a ¼ ounce weight. (This bait would become key later in the week. 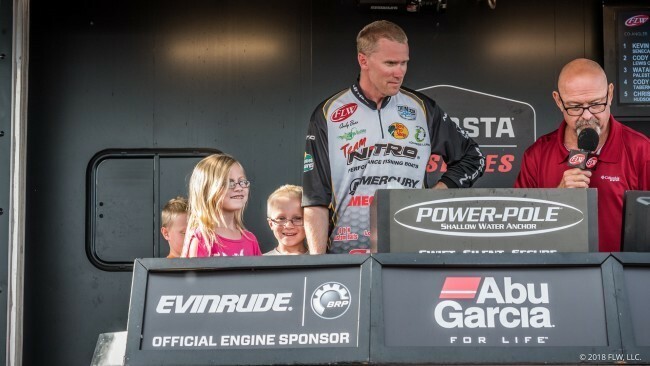 It was also key for a 24th place finish in the 2014 Bassmaster Open here.) I was then drawn to the shoreline because of lush vegetation. The frog produced a 2.5 pound largemouth, but also several other blow ups. While in Gander Bay, I was trolling out of the vegetation to the breakline when I saw a school of terns diving on the surface. I put the trolling motor on high and raced to them. Baitfish were surfacing, and on my second cast, landed a 3 pound smallmouth with the chatterbug. It was the best fish up to that time, but that was a fluke deal. No one should ever turn away from diving birds, but it is also something you can never count on during a tournament. To my puzzlement, it was the only fish I caught despite obvious feeding by predators on the baitfish. It was early afternoon, and felt I had exhausted most of the eastern half of the bay, so I went to the west side. A shoal on the east side of it caught my attention, and almost immediately caught a little smallmouth and handful of rock bass on the aforementioned tube. After studying my gps for a moment, I noticed another shoal on the west side and checked it out. On my first cast I caught a smallmouth nearly 3 pounds. Over the next 25 minutes, I boated a half dozen, including another over 3 pounds. All of the fish were at least 2 pounds. After making a few waypoints, I left thinking that this shoal is a place worth remembering. After 90 minutes here, I fished the riprap along the bridge leading into Blanchard Bay. There I had a half dozen jig trailers torn off by perch, but also had one 3 pound largemouth bite my jig, but shook loose before getting to the boat. To be frank, I was surprised and frustrated: I quickly vented on my YouTube video. This was an area I was convinced I would catch some fish, but I had just one bite. When finished with the riprap, I ran to the northeast corner of the bay. With the tube, I boated several fish, but none that were in excess of 3 pounds. Clearly, this was a spot to catch keepers, but not the size I needed. From there I ran south to Pelots Bay. Almost immediately, I began catching good sized largemouth on the same chatterbug. It was fast and furious. I was pumped! After catching a good limit, I ran to the opposite bank and caught several more quality fish by flipping a jig to docks and laydowns. In just an hour, I had a 16 pound limit of largemouth, and I did not beat up the fish. I was happy, because I had found a third spot holding quality fish. If I could get 8 spots to rotate through come tournament day, I would be ecstatic. As I worked my way through Carry Bay, the skies opened up and bombarded me mercilessly with heavy rain. Thunder and lightning accompanied it. Carry Bay produced just a couple of small largemouth on the chatterbug, and I covered much of it while getting saturated. During a break in the rain, I tried the Horseshoe Shoal. In 45 minutes of searching, I had just a single bite that shook off, but more discouraging was the lack of life on the screens of my Humminbird graphs. A storm was approaching from the South, so before I got inundated by more rain, I ran to Fleury Bay, but for naught. Only a single pike bit my bait. I hit several spots along the West side of Isle La Motte, but never caught a fish. Trombley Bay produced the same results. Finally, I ran to The Gut and fished the bridge. On one of my first casts, I landed a 2.5 pound largemouth with a Lochness Lures Monkey Punch. While it was not the size of fish desired, I was just relieved to have caught a fish since it had been a couple of hours. I worked a couple of other spots in the bay without luck, and while working a set of docks, a property owner warned me about a violent thunderstorm heading my way. A quick glance west showed the formidable clouds. No need to repeat “Moments that Happen,” so I packed up for the day having discovered a new good spot, but too many hours of dead water. As I began north up the passage, I noticed some docks on the west side and stopped. Surprisingly, I found a few little smallmouth on beds, including a 2.5 pounder, and also landed some largemouth fancasting the chatterbug. There were fish in this area, but not the right size, so I ran to Squires Bay. This bay was another bust - not a single bite. To be sure the City Ledge was legit, and it was so close, I stopped there next to make a few casts. On my third cast I caught a 3 pound smallmouth on same tube. It was the confirmation I needed. In hindsight, I should have stayed and learned the area’s intimate details. It would have saved me a little time during the tournament. From there I entered the Inland Sea and headed straight for Allens Bay. It was my hope to catch a few largemouth, but that did not happen. The point leading into it looked like great smallmouth habitat, but it also failed to yield any fish. Gull Island Reef seemed to be set up similarly to the City Ledge, so I stopped. It was more wasted time, because I could not coax a bite from anything and my graphs did not show any life. At that point in time, frustration was beginning to mount. Reality told me I was fine, but I had not gotten onto a good bite for over 24 hours, and I like feeling something tug back on my line. This prompted me to take the long run to Keeler Bay in the southwest corner of the Inland Sea. When I got there I saw great weeds. However, pitching jigs and twitching frogs only produced a single strike from a small bass, so it was off to Malletts Bay. All of my time was spent in Outer Malletts Bay, and I I covered nearly everything between Robinson and Allen Points without a single bite. The reeds between Mills and Porter Point was an area I wanted to try, but the north winds were so strong, by time I got there it was a muddy mess. The water looked like chocolate milk. 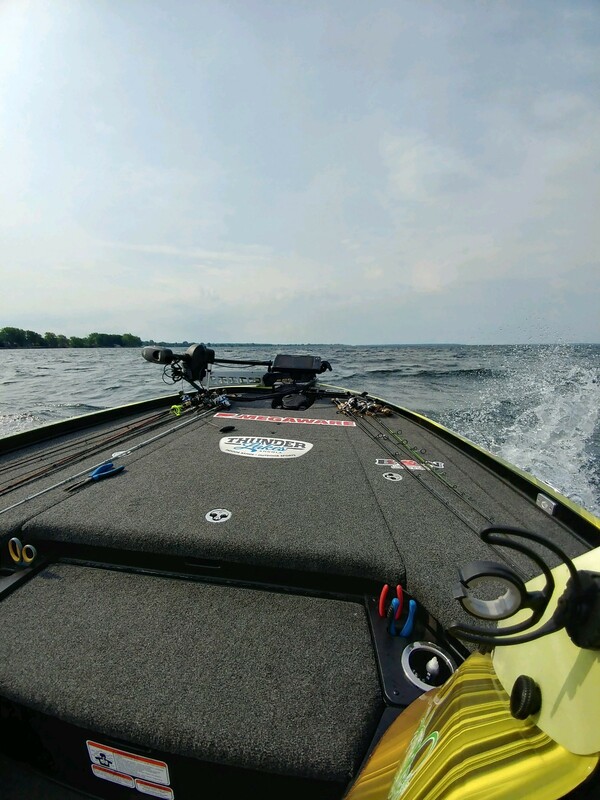 My belief on Lake Champlain is if the fish are present, they’ll bite. So I was not soaking every spot with a multitude of baits. I would toss 2 or 3 and if not get bit, move on. Perhaps this was a poor strategy, or correct. I went left out of Malletts Bay to look for bedding smallmouth between Colchester and Appletree Points. They were protected from the wind, but mud was flowing around Colchester and going all the way to Appletree. It was impossible to see any fish, so I then went to Valcour Island. If just looking for pretty scenery, this is the place to be. It is beautiful. Bluff walls are complemented with big boulders, and you can see the route the boulders took when falling into the lake. While the water was calm and crystal clear, I was not able to see any fish, so I fancasted a Leviathan stickbait. On my third cast, I caught a 2 pound smallmouth, and I got 2 more bites. I worked around to Bluff Point without another strike. Frustrated is the right word. There was too much time left to quit for the day, but I had covered every place on my agenda. Treadwell Bay was on tomorrow’s agenda, but I made it this day. After making the long journey to the north shore, I explored both channels without a bite - and they looked perfect! 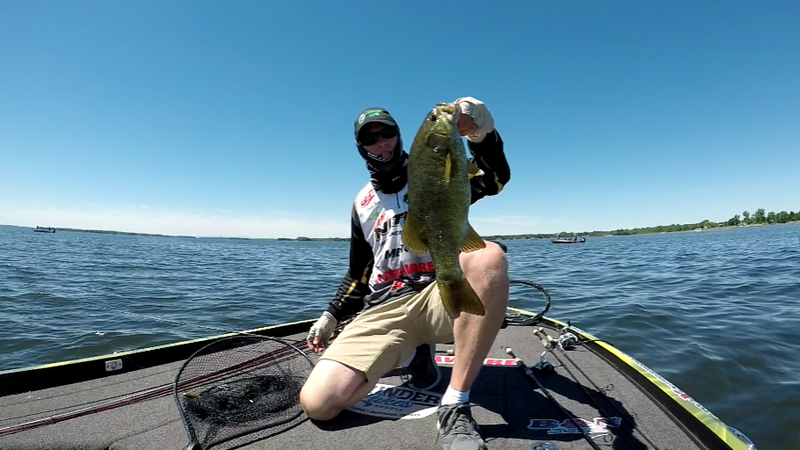 I inched out to the point on the northeast corner and caught a 14” smallmouth on the tube. I then extensively explored the shoals in the middle of it - not a single bite. From there I covered the west bank looking for beds and fancasting tubes and stickbaits - still nothing bit back. I ended by fishing the ferry landing. In 2014 I had caught some fish there, and I did again on this day. Several 12-13 inch smallmouth eagerly bit the tube and Monkey Punch, but not any quality. My day was over. From there I ran back to Alburgh Passage to junk fish. I skipped many docks with the jig and threw the chatterbug in between. Several fish fell victim to both baits. Nothing was over 2.5 pounds, except one fish under a dock, which bit the jig, and then tangled in some metal. My 17 pound fluorocarbon line snapped immediately. Maybe it was a pike, but I’m pretty sure it was a monster largemouth. After making a few waypoints, I went to Reed Point and worked north. In a small weed patch I caught a 4 pound largemouth on a 9k Elite Lures chartreuse spinnerbait. I tossed back in there and had a strike. A smallmouth followed it back the next time. As I proceeded north I caught several 2 pound smallmouth on a tube and saw some bed activity, but none large enough to target. 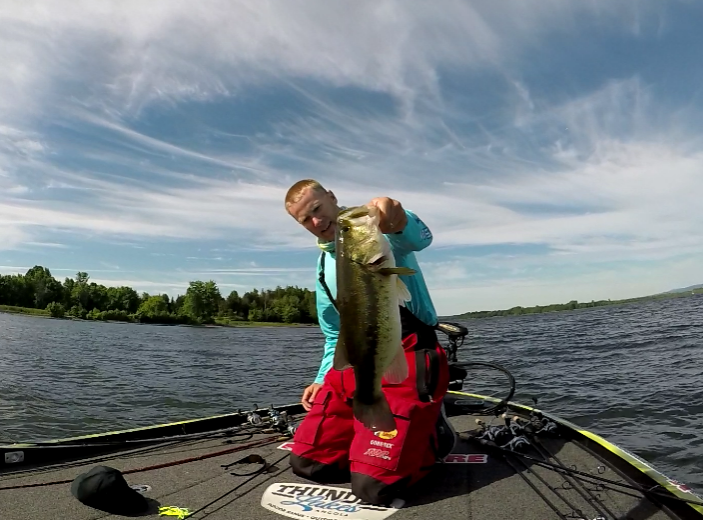 As I headed back to the ramp, I felt that if the stars aligned right, I could catch 17 pounds - a mix of largemouth and smallmouth. But things would have to go my way - good decisions and flawless execution. We would head toward City Ledge, but first stop in Alburgh Passage where I had found some bedding smallmouth. This was poor decision #2, as it did not yield one fish! Over 2 hours into the tournament, and my livewell was empty. Off to City Ledge. The obviousness of my poor decisions was prevalent immediately. One of my first casts with the tube produced a 3 pound smallmouth. 10 minutes later, and I had another 2.5 pound fish. On the very next cast, a 3.5 pounder shook off 10 feet from the boat. My co-angler also caught 2 keepers in the first hour. The action waned, so we ran up to the shoal in Missisquoi Bay. My co-angler’s first cast produced a keeper. Over the next hour, we both finished our limits. At 11:00 when the action died down, we ran back to the City Ledge. We both culled fish. Here is the rationale for poor decision #3: it was clear that a miracle was needed to net 17 pounds of fish, but 15 per day historically places an angler in the money. I knew I had about 14 pounds with my smallest fish weighing less than 2 pounds. 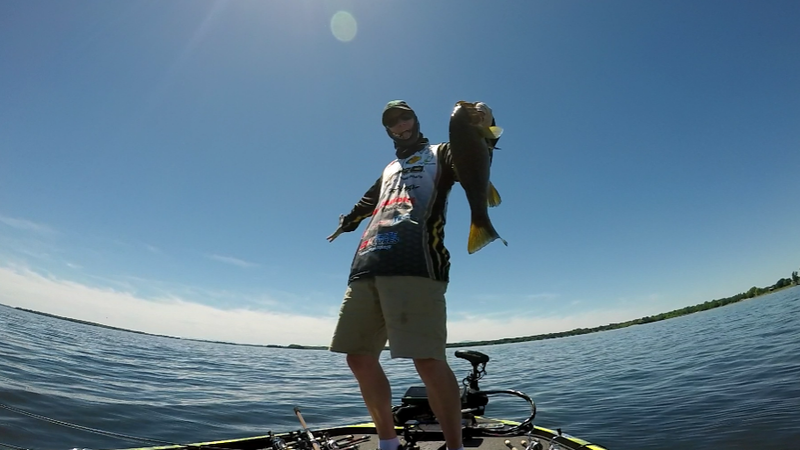 20 miles away on the north end of Isle La Motte was a solid 3.5 pounder. I could catch that fish and leave the fish at City Ledge unmolested. So, at 12:15 we left to catch that bedding fish. When we arrived at 12:45, I was devastated to see that fish gone. No way it left on its own - someone else caught him. Without enough time to get back to the City Ledge, I ran us to the northeast side of the bay where I had caught some on my second day of practice. As predicted, smaller than needed fish were all that bit. I weighed 14-03 pounds, not good, but not terrible. I assumed I would be somewhere in the 80’s within 2 pounds of check range. Boy, was I wrong! That landed me over 3 pounds out of check range and in 130 place!! It would take a monster bag and miracle to find myself with a check, but that was the plan I was forced to create. Just that previous night I put fresh line on this rod in anticipation of heavy use. If there was any chance of a 17-18 pound limit, I needed this fish, which I believed to be in the high 4-pound range. After regrouping I, surprisingly, caught a 2 pound largemouth, but then the bite fizzled. After an hour without any luck, we ran to the shoal in Missisquoi Bay, and nothing happened. Besides a pair of rock bass and a 13 inch smallmouth for my co-angler, nothing bit our baits. I was stunned and mad. McGregor Point Ledge sits between Missisquoi and the City Ledge and I had caught a few fish there in practice, so we stopped there with a host of other competitors. At first we listened to griping from other competitors. Then we began to see competitors catch fish - it seemed like all of them except us. It wasn’t a rampant bite, but consistent: one here, another there, then another, etc..
After considerable disgust enveloped my mind, my first bite came. I reared back and let that fish have it, but my line snapped! It was the same line as the last break, and then I got to watch the 3+ pound smallmouth jump several times trying to shake loose the tube. Talk about being mad. That is 8 pounds in 2 fish that broke my line. I stubbornly stayed in the area even as all of the other boats left, and that was the first good decision I made that tournament. Knowing the fish were there, it was a matter of time before I would figure them out. The key was the Formula G3 tube being worked especially slow in sparse weeds next to rock. When I finally figured out the retrieve and the sweet spots, we both went on to not only finish our limits but cull many times. During the last 90 minutes, the lake was as calm as glass. This is when I got out the topwater. On my second cast a 4+ pound smallmouth crushed it, but pulled loose after setting the hook. It then did acrobatics to fully display itself. A couple of 2 pounders fell victim to the bait. In the final minutes, my co-angler boated a 3-10 smallmouth and another 3+ pounder blew mine up and came unbuttoned. My goal was 18 pounds for that day, and had I caught all that bit I would have cleared that goal. As it was, I weighed 16 pounds even. It pushed me up 26 spots to finish 104, but still 3 pounds out of cashing a check. In hindsight, I should have put my marbles into the shoals and points by the City Ledge and similar spots. Too much time in practice was spent running around trying different spots and patterns. The tournament was dominated by bedding smallmouth, which never materialized for me. This was my first time traveling to an Open Tournament with my family. Without question, it was awesome. They kept me grounded, made me laugh, smile, relax, and were tremendous supporters. My wife, Nicki, is my glue. She not only took care of the kids, but took care of me. She ran errands, cleaned laundry, bought oil for the boat, and made sure we all ate. My only regret is not giving her a big check for our efforts. 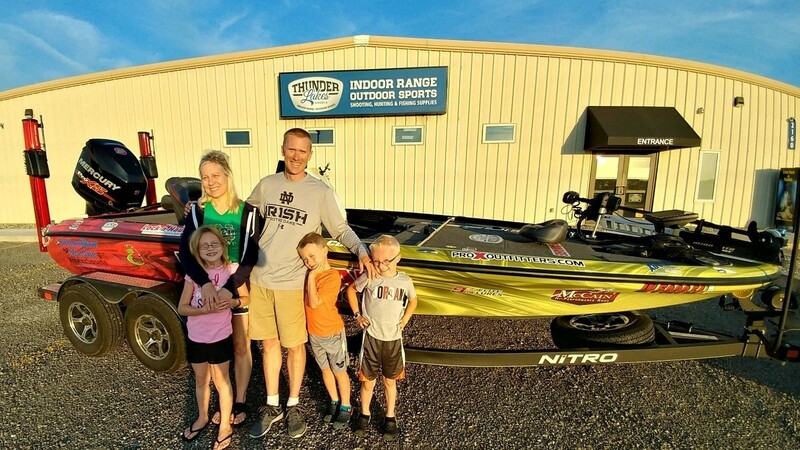 That check comes next time though - at the Bassmaster Open on Lake Champlain August 2-4!